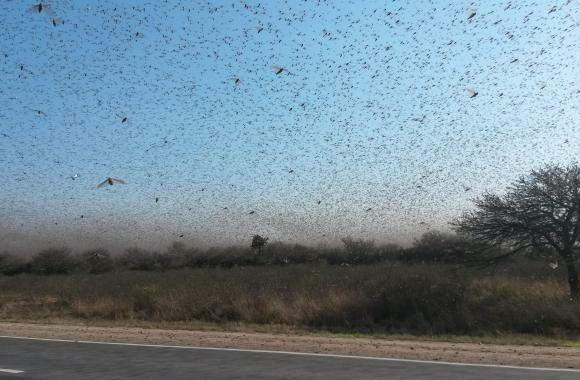 While it’s not unheard of for northern Argentina to have locust swarms, it has been at least 50 years since an outbreak of this magnitude. The swarms can stretch to eight square miles, Karnatz says, and they eat everything in their path. So far they’ve mostly been eating not from crop fields, Karnatz says, but from pasture lands, though several thousand acres of mostly onions are destroyed. As a major agricultural player, Argentina is a place whose rural problems raise eyebrows in U.S. farm country. Farmers here, though, don’t have much to worry about when it comes to massive swarms of locusts. Routine monitoring and control could have prevented the problem in Argentina, critics of the government say. Many say officials in the government of former President Cristina Fernández de Kirchner failed to develop an adequate plan to combat the bugs, and failed to spend the money needed to head off the plague. “I guess that the problem was that the government didn't do their job correctly in the past two years,” said Fernando Miguez, an agronomy professor at the Catholic University of Argentina in Buenos Aires. Locusts are merely particular types of grasshoppers that, when their numbers swell thanks to favorable weather and plentiful food, transition from solitary critters to gregarious masses – ravenous swarms that create dark clouds and devour anything green. The government can spray insecticides when conditions are favorable for an outbreak, Miguez said, in order to control for the massive amount of bugs and prevent the swarms. Farmers began seeing the two-inch long grasshoppers in June 2015. Now, the Argentine agriculture department is on the job . Miguez says its efforts could keep the locust from reaching major cash crops including corn and soybeans. “They are spraying them and hoping that all the pockets they find and they spray, it's enough to prevent a swarm to develop,” Miguez said. It will be weeks, if not longer, before anyone knows for sure how localized the outbreak remains. And it could be a year or two before the infested area fully recovers. As detailed in the Bible's Book of Exodus, locusts are plague number eight. But as a new generation of Argentine farmers can attest, locust are not just a Biblical threat. Here in the U.S., however, farmers need not worry. “The good news is of the several species of migratory grasshoppers that form these locust plagues, none are currently in North America,” said Donald Lewis, an entomologist at Iowa State University. While the U.S. is still home to lots of grasshoppers, many likely fall victim to the pesticides used to control other bugs in crop fields. Eradicating grasshoppers, however, is not the goal. On rangelands, in fact, they remain a crucial part of the ecosystem . “They actually stimulate plant growth,” said Alexandre Latchininsky, an entomologist at the University of Wyoming. Grasshoppers fertilize dry pasture land, Latchininsky said, and they provide food for sage grouse and other Western wildlife. Locust plagues did terrorize pioneer settlers on the Great Plains – think Little House on the Prairie or the Mormon Trail. But loss of habitat mostly dealt with that, Latchininsky said. So here at least, we should be safe from locusts. As for the other nine plagues...you’re on your own.